In this world there are only two animals that can see behind without turning their heads. 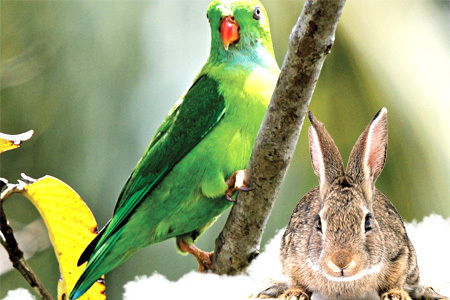 They are Parrot & Rabbit. Animals which have a very wide field of view that actually extends far enough around the head that they can see behind them. These animals would need to have eyes on the sides of their heads, rather than the front. Then, the eyes or the skull, would have to be arranged in such a way that nothing blocked the field of view towards the back. Yes, rabbits and Parrots eyes are on the side of their head and can swivel ( rotating ) 360 degrees. This is so it can see all predators ( enemies) . They also swivel independently so it can keep it’s eyes on 2 predators at once. that’s why they are hard to catch. Rabbit eyes are placed high and to the sides of the skull, allowing the rabbit to see nearly 360 degrees, as well as far above their head. Parrots, like most prey animals have eye that are widely spaced, on either side of the head. This allows for a wide range of vision (almost a 360 degree field of sight in some species). This means these birds can see things coming at them from almost any direction and angle.